When a softball team is battling back, it’s “chasing” runs. So, when Cups & Bras was coming up for its final at-bat in Sunday’s Hailey Coed Softball League tournament championship game, Cups & Bras trailed 21-16. That meant they were “chasing five runs” to get even. Cups managed only one run, as it turned out. So everybody is still chasing 7 Dog Ranch after a full summer of competition in the Hailey slow-pitch softball league—indeed, after five years of a relentless 7 Dog Ranch winning spree. 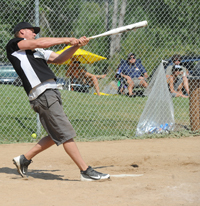 7 Dog Ranch and Cups & Bras battled like two heavyweights Sunday in the dramatic final games of the Hailey Coed Softball League tournament at Lions Park in Hailey. In the end, the championship stayed with top-seeded 7 Dog Ranch (17-3) by virtue of 13-12 and 21-17 victories over No. 2-seeded Cups & Bras (13-6). 7 Dog Ranch’s fifth consecutive Hailey Coed Softball League tournament title tied Uhrig Fencing (1995-99) and Wicked Spud (2000-04) for the longest tournament winning streaks over the slow-pitch league’s 25 seasons of action on the Lions Park diamond. Tournament Most Valuable Player T.J. Petersen (.905 batting average, 7 HRs) belted two-run homers in his final two at-bats as 7 Dog Ranch rallied from a 16-12 deficit in the decisive game and prevailed 21-17 with a 30-hit offensive attack. Petersen finished 5-for-5 with 5 RBI in the final game. Three other 7 Dog Ranch men were perfect at the plate in the finale—Greg Edwards (4-for-4, 2 RBI), captain/shortstop Sean Harrington (5-for-5, 5 runs, 5 RBI) and pitcher Joe “Fish” LaManna (4-for-4, 5 RBI). Cups & Bras seemed headed for its first-ever tournament title when captain/pitcher Kenny Nelson’s squad pieced together a 13-run third inning capped by Ryan Stavros’ grand slam homer that erased an early 9-0 lead for 7 Dog Ranch. But 7 Dog Ranch was relentless in defending its title and finished its season with a five-run seventh to seal the deal. During the five-year streak, 7 Dog Ranch has a glittering 84-6 record. The winners had captured 13 consecutive city tournament games since 2009 before Cups & Bras upset 7 Dog Ranch 16-11 in Sunday’s semi-final game and bumped 7 Dog into the loser bracket. Boosted by its first win of the season over 7 Dog, Cups & Bras had a chance to eliminate the champs in Sunday’s first of two championship games. But 7 Dog Ranch tallied four runs in its final at-bat and rallied past Cups & Bras 13-12 to force the deciding game. Named female MVP was Cups & Bras first baseman M.J. Musselman (.500 batting). Third place in the two-day, six-team double elimination tournament went to No. 3-seeded Power Engineers (11-8), which won three of its five games led by the hitting of Kyle Bennett, Ben Bainbridge, Michael Adamson, Jason Marenda and Jared Eby. Bennett was nearly unstoppable with 18-of-20 hitting success (.900, 3 HR, 7 doubles) and 17 runs scored. Others were Bainbridge (11-for-18, .611, 5 HR), Adamson (14-for-18, .778, 3 HR, 3 doubles), Marenda (10-for-16, 2 HR, 2 doubles) and Eby (10-for-17, .588, HR, 5 doubles). For 14 innings of Sunday’s two championship games and all the way down to the final at-bat, nobody knew who was going win. Both teams played superior defense and had timely hitting. 7 Dog Ranch (.514 team batting) hit more consistently, though, and scored at least one run in 12 of its 13 at-bats. Cups & Bras (.490) was held scoreless in six of its 14 at-bats. One key to the ultimate outcome: In the final inning of the final game with the score tied 16-16, 7 Dog Ranch sent the top of its batting order to the plate and scored five times. Cups & Bras sent up the bottom of its order and scored only once. Cups & Bras had its chances in the first game, using a six-run first and homers by Kenny Nelson (3 hits, 5 RBI), Justin Herald and Casey Hawkes (3 hits, 2 doubles) for a 12-9 lead in the sixth. But 7 Dog Ranch got excellent production from the bottom of its order in the home sixth and scored four runs. One-out singles by Wendy Hosman, Buddy Peterson and Lisa Valdama (2 hits) preceded huge two-out RBI singles by JonMarie Shaw and LaManna that gave 7 Dog a 13-12 lead. In the visitor seventh, Cups filled the bases with two outs but 7 Dog outfielder T.J. Petersen gloved a hard drive by Stavros to end the threat and the game. 7 Dog’s leading hitters included Tom Moreland (3 hits, 3-run HR), Petersen (3 hits, 3 RBI), LaManna (3 hits, 2 runs). The outcome meant there would be a winner-take-all second championship game for the first time in Hailey since 7 Dog Ranch won its initial league title in 2009 with 7-0 and 13-12 wins over Wicked Spud/Bradley Construction. At first, 7 Dog Ranch rode the momentum of its earlier win, sending up 12 players in a nine-hit, eight-run first inning. It was 9-0 in the home third when Hawkes jump-started the 15-batter, 13-run Cups & Bras comeback with a solo homer. The grand slam homer by Stavros capped it. Stunned and suddenly in a 13-9 hole, 7 Dog Ranch regrouped with a two-out, three-run homer by Harrington. That’s when Cups shortstop Bryan Burrell (4-for-4, 5 RBI) replied with his own three-run homer for a 16-12 Cups advantage. Doubles by LaManna and Greg Edwards followed by a two-out, two-run homer by Petersen cut the 7 Dog Ranch deficit to 16-15. And pitcher LaManna retired Cups 7 Bras 1-2-3 in the home fifth—continuing a run of seven straight Cups & Bras batters retired without a hit. Harrington doubled and scored on LaManna’s two-out RBI single for a 16-16 game in the sixth. In the seventh, Moreland legged out a leadoff infield hit and Petersen slugged his second straight two-run homer. With two outs, four straight singles capped by LaManna’s two-run hit made it 21-16. Cups & Bras scored once in the home seventh and filled the bases with two outs before its season ended with a grounder. See next week’s Local Life for more Willy Cook photos. Aug. 10-11, 2013 at Lions Park, Hailey. A total 11 games played, 320 runs scored. TEAM, SEASON RECORD......................... REC.... RUNS VS. The Shockers enjoyed a 9-run fourth to pull ahead 13-4. But Alternative rallied with 5-run fourth and sixth inning uprisings, and won it with a 1-out, solo HR by Jeff Stedman and a 2-out game-winning solo HR by Donavon Romrell in the seventh. Alternative: Joe Molyneux 3 hits (double) and 3 runs, Ashley Boullon 3 hits and 2 runs, Brandon Ivie 3 runs. Shockers: Jim Bradley and Jeff Martin 3 hits (double, HR) and 3 runs apiece. Power stretched its 7-3 lead to 15-3 with an 8-run fourth as Ben Bainbridge (3 hits, 2 runs) cleared the bases with his second round-tripper. Power: Kyle Bennett 4 hits (HR, triple) and 4 runs, Michael Adamson 3 hits (2 doubles, triple) and 2 runs, Jared Eby 2 doubles and 2 runs. Mahoney’s: Mike Beall and Anthony Rooney 2 hits. Cups & Bras put together a 10-run second and 5-run third for an 18-2 lead before Power rallied late with 12 runs in its final three at-bats. Cups: Kenny Nelson RBI triple and double, 3-run HR. Power: Jason Marenda 3-run HR, Ben Bainbridge and Michael Adamson 2-run HRs. Trailing 7-6, Cups & Bras sent 13 batters to the plate in a 10-run sixth. Kenny Nelson (3 hits, 3 runs) delivered a pair of RBI doubles in the big inning along with his 2-run HR. Also belting clutch hits in the decisive frame were Morgan Uhrig (3 hits) with an RBI double and Karly Maratea (2 hits, 2 runs) with an RBI triple. 7 Dog Ranch: T.J. Petersen 4 hits (2 HR, 2 doubles) and 3 runs, Sean Harrington 3 doubles and 2 runs, Joe LaManna 2-run HR, Buddy Peterson 3 hits (2 doubles) and 2 runs. Alternative sent up 12 batters in its 7-run first and held Mahoney’s to just 8 hits. Alternative: Joe Molyneux HR. Mahoney’s: Brandon Beall HR and double. Power surged ahead 17-10 with a 9-run fifth, but the Shockers cut their deficit to 17-15 with a 5-run sixth as Jim Bradley clouted a 3-run HR. Power finished the game with a 5-hit, 6-run seventh and advanced. Power: Kyle Bennett 5 hits (2 doubles) and 4 runs, Ben Bainbridge 3 hits (3-run HR, double), Michael Adamson 3 hits (3-run HR, double), Jared Eby 4 hits (HR, 2 doubles) and 3 runs, Richard Ulrich 3 hits and 3 runs. Shockers: Pat Ballou 3 hits (grand slam HR, 2 HR) and 3 runs, Jeff Martin 3 hits and 3 runs. Probably the most exciting game of the tournament started out like a rout when Power used an 8-run first to jump ahead 12-3 after three innings. Alternative stormed back with a 16-3 scoring edge in the fourth, fifth and sixth stanzas for a narrow 19-17 edge. Trailing 20-17 in the final frame, Power struck for 5 runs with two outs on walks to Richard Ulrich and Lindsay Atienza, a double by Kyle Bennett (4 hits, 4 runs), a single by Jamie Ulrich and a game-winning 3-run HR by Ben Bainbridge (2 hits, 3 runs). Power: Michael Adamson 4 hits and 4 runs, Jason Marenda 3 hits (grand slam HR). Alternative: Rich Lang 4 hits (2-run HR) and 3 runs, Brandon Ivie 2-run HR, Jeff Stedman 3 hits (3-run HR, double), Joe Molyneux 3 hits (triple) and 3 runs, Jeff Jones 4 hits, Alex Stedman 2 hits (triple) and 2 runs. 7 Dog had a pair of 7-run innings to end Power’s season. 7 Dog: Tom Moreland 3-for-3 (2-run HR), Sean Harrington 3 hits, Joe LaManna 3 hits (HR). 7 Dog Ranch (.514 team batting, 108-for-210)—T.J. Petersen 19-for-21, .905, 14 runs, 7 HR, 8 doubles; Joe LaManna 16-for-20, .800, 2 HR, 2 doubles, 9 runs; Greg Edwards 11-for-16, .688, HR, 2 triples, 4 doubles, 10 runs; Sean Harrington 12-for-17, .706, HR, 5 doubles, 10 runs; Tom Moreland 9-for-14, .643, 3 HR, 3 doubles, 8 runs; Lisa Valdama 9-for-20, .450, 4 runs, double; JonMarie Shaw 7-for-19, .368, 4 runs; Anna Edwards 8-for-23, .348, 2 doubles, 9 runs; Buddy Peterson 6-for-16, .375, 3 doubles, 6 runs; Wendy Hosman 6-for-20, .300, 4 runs; Hannah Gove 5-for-20, .250, 6 runs; and Hoss Schmidt. Cups & Bras (.490 team batting, 77-for-157)—Kenny Nelson 11-for-15, .733, 3 HR, 7 doubles, triple, 10 runs; Justin Herald 8-for-12, .667, 2 HR, 3 doubles, triple, 5 runs; Bryan Burrell 9-for-14, .643, HR, 3 doubles, 7 runs; Morgan Uhrig 7-for-11, .636, 4 doubles, triple, 6 runs; Casey Hawkes 7-for-12, .583, 3 HR, 3 doubles, 6 runs; Ryan Stavros 9-for-17, .529, 3 HR, double, 10 runs; M.J. Musselman 8-for-16, .500, 5 runs; Kathy Harper 2-for-4, .500, 2 runs; Brenda Blackwell 7-for-15, .467, triple, 5 runs; Karly Maratea 5-for-14, .357, triple, 6 runs; Steph Miller 3-for-15, .200, double, 3 runs; and LeighAndra Roberts 3 runs. MOST VALUABLE PLAYERS—First baseman M.J. Musselman of Cups & Bras, 8-for-16 (.500) with 5 runs scored, and center fielder T.J. Petersen representing 7 Dog Ranch, 19-for-21 (.905, 7 HR, 8 doubles) including 13 RBI and 12-for-13 batting in his team’s three games against Cups & Bras. LEAGUE TOURNAMENT CHAMPIONS (25 seasons)—1989, Pozzi of Idaho. 1990, Miller Draft/Ram Motors. 1991, Coors/Sawtooth Auto/Sky West. 1992-93, Uhrig Fencing. 1994, Litzinger Construction. 1995-99, Uhrig Fencing/River Run Auto Parts. 2000-04, Wicked Spud. 2005, Anderson Asphalt. 2006, Oak St./LDE Electric/Budweiser. 2007, Uhrig Fencing/Anderson Asphalt. 2008—Smith Sport Optics. 2009-10—LDE Electric/Little Wood Builders. 2011—7 Dog Ranch/ESS. 2012—7 Dog Ranch. 2013—7 Dog Ranch.